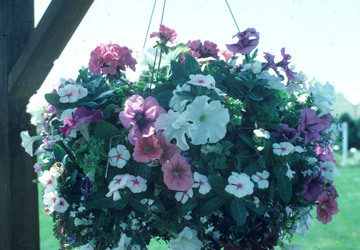 Hanging baskets are container gardens that are suspended overhead. They are great for giving the illusion of bringing down the height of very tall spaces and making great visual impact. 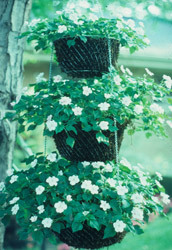 Planting hanging baskets is not much different than planting containers that are on the ground. As far as a choice of container there are basically three: solid plastic, wood and wire. Plastic and wood are very easily handled by filling with media and planting. With wire, you need to first line the container with something to keep the soil from falling out. This is done with either sphagnum moss or pre-formed coir basket liners. If using sphagnum moss, wet the most thoroughly before using. Then, taking handfuls off moss, pack it into the wire basket from the inside of the basket. Do this until the whole frame has been lined forming a pocket in the center that is then filled with media. There are also pre-formed liners made from coir (coconut fiber). These forms come in various sizes and are placed over the top of the container and gently pushed down so the liner conforms to the container. With lined wire baskets, watering and keeping the container moist is of major concern. These types of containers loose a tremendous amount of moisture through the sides as well as through normal drainage out of the bottom. To reduce the moisture loss and cut down on watering frequency, it sometimes helps to incorporate a barrier to reduce moisture loss. Simply lining the inside of the moss lined basket with plastic prior to filling with media will help reduce moisture loss. Be sure to punch a few holes in the bottom of the liner for drainage. There are also coir liners available that have a plastic liner sandwiched between the coir layers to help reduce moisture loss. After lining, fill the container with media. 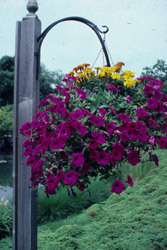 Most hanging baskets are planted at the top. If you are using moss or coir fiber lined baskets, you also have the opportunity to plant through the sides. If baskets will be hung at or slightly below eye level, follow a traditional planting scheme for ground containers. Locate upright or taller plants in the center with shorter and trailing material towards the middle and edge. 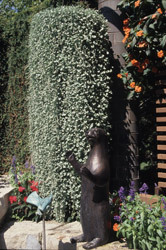 If the basket will be located well above eye level, the tall center plants can be eliminated and use mainly rounded or trailing forms of plants. Baskets planted only with trailing types of plants may take a while to achieve a "full" look but soon will hide the basket completely. Some trailing types to consider are the trailing petunia, bacopa, scavola, sweet potato, verbena, calibrachoa, dichondra, ivy and lysimachia. Planting through the sides has its advantages if you want a completely full looking basket and only want to use non-trailing types of plants. Plants such as wax begonia, pansies, alyssum, brachyscome or impatiens can be used. To plant into the side walls, the suggested method is after you have lined the basket with moss or inserted the liner, cut holes into the sides of the liner spaced around the basket starting at the bottom. Fill with media into the bottom of the hole. Insert the plants though the hole and fill in with soil to the level where the next series of holes will be cut. Insert plants and finish off with media, planting the top last. After planting, water thoroughly to get media around the roots of the plants. Also keep the moss moist to help the plants to root quicker. One of the major maintenance issues with baskets is watering. Both solid baskets and especially moss lined baskets dry out quickly. This is especially true later in the season. When watering, fill the top of the container with water and allow it to drip out of the bottom of the basket each time you apply water. Try to maintain uniform soil moisture. Feel the soil or watch the plants for signs of slight wilting. Frequent severe wilting will impact upon the quality of the basket. With frequent watering, fertilizer application becomes important. Apply fertilizer every two weeks or use one of the slow-release types of fertilizer mentioned in the fertilizer section. Combining slow release with a half strength liquid fertilizer program will insure good looking baskets through the season.